This month the Hobby-Eberly telescope finished receiving $40 million upgrades that astronomers hope will help solve mysteries of the universe. When McDonald Observatory first opened its doors in 1933 it was done with a nearly million dollar donation from a Paris, Texas banker. In his will, W.J.McDonald gave money to the University of Texas at Austin to establish the observatory. A move that confused McDonald’s family and others, since at the time UT didn’t have an astronomy department. Since then, it’s evolved into one of the nation’s foremost research observatories. 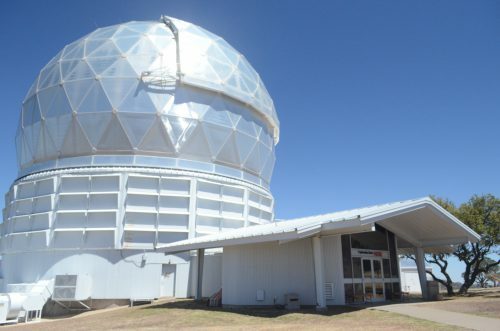 Now one of its telescopes finished a $40-million upgrade. The new and improved telescope is now turning its lens towards one of biggest unsolved mysteries in the universe: What is dark energy? Outside of Fort Davis, Texas, the winding roads that cut through the Davis Mountains take you up to McDonald Observatory. Road signs tell you to keep your lights dim. The darker the skies, the clearer the view for the observatories collection of 5 research telescopes. One of which just got a big makeover. Taft Armandroff – the observatory’s director – shows me the guts of the Hobby-Eberly Telescope or HET as it’s often called. From where we’re standing, the telescope looks like an 80-ton dreidel and when it turns, it’s loud. HET is one of the largest telescopes in the world and was designed for spectroscopy. That is, designed to receive the light from galaxies and stars millions of light-years away. But recently, Armandroff says astronomers found that power wasn’t enough. “For the kinds of science we wanted to do — like this study of dark energy which is the most powerful force in the universe – we just did not sample enough area of the sky and study enough galaxies to get the kind of fundamental results on that that we’ll now be able to learn,” Armandroff said. HET’s upgrades give astronomers a 100-times larger view of the nighttime sky. Now they can search unexplored parts of the universe for black holes, faraway galaxies, and planets. On top of that, Armandroff says the telescope also has 4 new instruments, like one called VIRUS. That’s a lot to take in, but basically VIRUS is like a super-powered camera that captures light from the depths of space 10 times faster than before. This allows astronomers measure the light from galaxies to see how far its traveled. “And these instruments are optimized for the study of cosmology, in particular understanding the accelerating expansion of the universe and detecting and studying planets around stars,” Armandroff said. That’s right — the universe is expanding. In the late 1990s, a team of astronomers discovered that the universe isn’t static. It’s growing, said Karl Gebhardt, an astronomer. “And at that time we said, ‘OK, we got to figure this stuff out. We know the universe is expanding, but our idea is to understand why,” Gebhardt said. Gebhardt’s question is at the heart of a project called HET DEX – the Hobby Eberly Telescope Dark Energy Experiment. The updates to HET, Gebhardt says, can potentially one day explain dark energy, the invisible force that astronomers assume is behind the expansion of the universe. the HETDEX project will look deep into space, some 10 billion years ago, and track roughly a million galaxies to create a map of the universe at that point. “So what we’re trying to do is measure the expansion rate as it was 10 billion years ago. We compare that to the expansion rate that’s been measured about 4 billion years ago, and it’s the differential measure that really has a big impact,” Gebhardt said. That magic number will reveal how fast the universe is expanding. Then, Gebhardt says, they’ll be one step closer to understanding just what dark energy is. This entry was posted in KRTS News, KXWT News and tagged Dark Energy, Hobby-Eberly Telescope, McDonald Observatory. Bookmark the permalink.